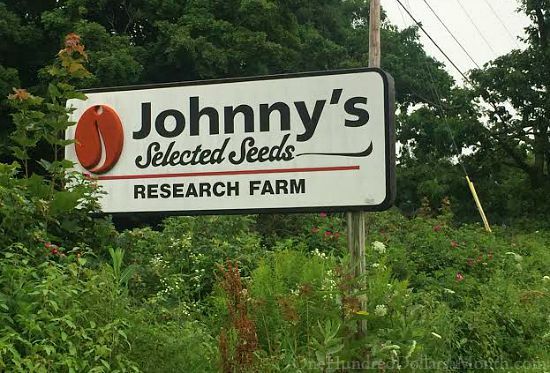 This is a guest post written by my buddy Heather from Massachusetts about her recent trip to Johnny’s Seed Company in Albion, Maine. She typically posts about her garden over on the east coast, but she’s changing things up a bit today. Imagine the ultimate garden. Big, straight rows of multicolored vegetable and flowers in a myriad of colors. The grass between the plots is thick, lush and mowed perfectly. The winding dirt road goes from the front road to the back plot past tractors, (I would have to line my tractors up too). And trees and beehives galore. This folks was not heaven, but the Johnny’s Selected Seed Trial Gardens in a teensy, tiny, modest town of Albion, Maine. The HH and I, while on a kid-free vacation (whoot-whoot), scooted off one cloudy day to tour the gardens. I knew their farm was going to be beautiful, but I grossly underestimated what we actually saw. True there was no-one to answer questions, and boy did I have a lot. For example, there were MANY rows of Bee Forage. Is that to support the farm or bees in a general health way, or were they experimenting with different varieties? Or both? Inquiring minds (mainly mine) were so curious! There were a dozen or two people in the field taking copious notes as they inspected and weeded their way through a plot and I honestly wouldn’t have wanted to interrupt them. I did learn quite a bit from the visitor’s guide though. One of the most interesting things was the sheer scope of the work they do. Simply spending an entire decade breeding a new variety that would not only capture the interest of the home gardener but make that same variety taste good, look good and perform in many climates seems to be a tall order and yet they’ve been doing just that since 1973. There is a company timeline of accomplishments at the back of the visitor’s guide. Did you know the company is 100% employee owned? How cool is that? We saw this in the parking lot on the way out – Ha! That just about says it all. I couldn’t be more impressed with this company. Johnny’s farm is located on Foss Hill Road in Albion, Maine, a farming community approximately 10 miles east of Waterville, Maine. Johnny’s trial fields are open to guests for self-guided tours from July through September. The farm is open daily, Monday through Friday, from 9 AM to 4 PM. Wow! What an awsome place! It really does, doesn’t it? it’s so refreshing to see a company develop a caring culture within itself. I’ve ordered strawberry plugs from Johnny’s and they are doing amazing. I’m so pleased, every single start took, which has never happened for me before. I’m so glad to learn more about the company itself. It makes me even happier that I ordered from them. Oh boy! As much as I try to stay content, I am downright envious! I would LOVE to tour Johnny’s Select Seed! And it would have driven me mad not to be able to ask questions. 🙂 I spend hours perusing their online catalog over the year. So happy you had a good tour! The tour was free. And you get a nice walk, garden eye candy, and it was nice to see a full circle of a healthy environment. Def worth a visit! In the mean-time, I’m off to do some garden chores. That’s my license plate! Glad you could appreciate it. No way!!! How cool is that? I think it’s AWESOME Kelly! Thanks for the kudos. Please let us know the next time you plan to visit — we would arrange a guided tour … with question answering. A great read and an excellent article about the Johnny’s’ Research farm in Albion. In answering your question about our “Bee Forage”, this is used as an attractant for honey bees, native bees, bumble bees, and other pollinators. It’s dual purpose is for the health of the local pollinators, domesticated bee hives and also for the successful pollination of our product in the fields. Again, Thank You both for the excellent article !